Occupational asthma is a form of lung disease in which the breathing passages shrink, swell, or become inflamed or congested as a result of exposure to irritants in the workplace. Hundreds of different types of jobs involve exposure to substances that could trigger occupational asthma, but only a small fraction of people who do such work develop this disorder. Occupational asthma is most apt to affect workers who have personal or family histories of allergies or asthma, or who are often required to handle or breathe dust or fumes created by especially irritating material. Although occupational asthma is not new, today, more than 240 causes of occupational asthma have been identified. It was probably first recorded in 1713 when one of the fathers of occupational health, Bernadina Ramazzini said bakers and textile workers had problems with coughing shortness of breath, hoarseness and asthma. Even short-term exposure to low levels of one or more irritating substances can cause a very sensitive person to develop symptoms of occupational asthma. A person who has occupational asthma has one or more symptoms, including coughing, shortness of breath, tightness in the chest, and wheezing. Symptoms may appear less than 24 hours after the person is first exposed to the irritant or develop two or three years later. At first, symptoms appear while the person is at work or several hours after the end of the workday. Symptoms disappear or diminish when the person spends time away from the workplace and return or intensify when exposure is renewed. As the condition becomes more advanced, symptoms sometimes occur even when the person is not in the workplace. 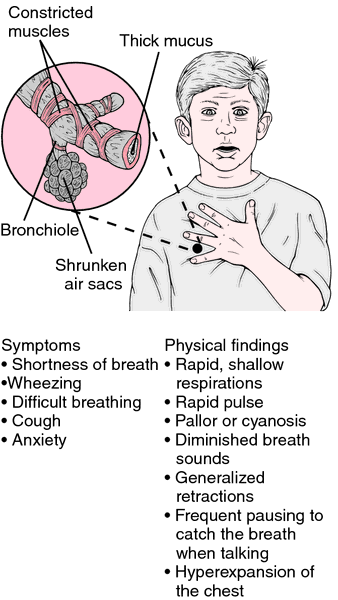 Symptoms may also develop in response to minor sources of lung irritation. Performed before and after work, pulmonary function tests can show how job-related exposures affect the airway. Laboratory analysis of blood and sputum may confirm a diagnosis of workplace asthma. To pinpoint the cause more precisely, the doctor may ask the patient to inhale specific substances and monitor the body's response to them. This is called a challenge test. The most effective treatment for occupational asthma is to reduce or eliminate exposure to symptom-producing substances. Medication may be prescribed for workers who can not prevent occasional exposure. Leukotriene modifiers (montelukast and zafirlukast) are new drugs that help manage asthma. They work by counteracting leukotrienes, which are substances released by white blood cells in the lung that cause the air passages to constrict and promote mucus secretion. Leukotriene modifiers also fight off some forms of rhinitis, an added bonus for people with asthma. Medication, physical therapy, and breathing aids may be needed to relieve symptoms of advanced occupational asthma involving airway damage. A patient who has occupational asthma should learn what causes symptoms and how to control them, and what to do when an asthma attack occurs. Because asthma symptoms and the substances that provoke them can change, a patient who has occupational asthma should be closely monitored by a family physician, allergist, or doctor who specializes in occupational medicine or lung disease. Occupational can be reversible. However, continued exposure to the symptom-producing substance can cause permanent lung damage. Follow-up studies of people with occupational asthma show that some cannot be protected from the exposure or are forced to change jobs, lose their jobs, or have worse prospects for future jobs based on their allergies and asthma. In time, occupational asthma can cause asthma-like symptoms to occur when the patient is exposed to tobacco smoke, household dust, and other ordinary irritants. Smoking aggravates symptoms of occupational asthma. Patients who eliminate workplace exposure and stop smoking are more apt to recover fully than those who change jobs but continue to smoke. Industries and environments where employees have a heightened exposure to substances known to cause occupational asthma can take measures to diminish or eliminate the amount of pollution in the atmosphere or decrease the number of exposed workers. Regular medical screening of workers in these environments may enable doctors to diagnose occupational asthma before permanent lung damage takes place. "Allergic to Work? Occupational Asthma Accounts for Up to 18 Million Lost Working Days a Year and Affects Thousand of Workers." The Safety & Health Practitioner September 2004: 38-41. Solomon, Gina, Elizabeth H. Humphreys, and Mark D. Miller. "Asthma and the Environment: Connecting the Dots: What Role Do Environmental Exposures Play in the Rising Prevalence and Severity of Asthma?" Contemporary Peditatrics August 2004: 73-81. American College of Allergy, Asthma and Immunology. 85 West Algonquin Road, Suite 550, Arlington Heights, IL 60005. (847) 427-1200.
an abnormal condition of the respiratory system resulting from exposure in the workplace to allergenic or other irritating substances. The condition is most common among people working with detergents, Western red cedar, cotton, flax, hemp, grain, flour, and stone. See also asthma, byssinosis, occupational lung disease. Clinical immunology A clinical complex that causes predominantly pulmonary Sx in previously healthy persons exposed to a noxious fumes or gases in the workplace; OA affect ± 3% of Americans, many of whom function adequately, despite Sx. See Hypersensitivity pneumonitis, Monday morning sickness, Sick building syndrome. A systematic review of the diagnosis of occupational asthma. Re ported incidence of occupational asthma in the United Kingdom, 1989-97. She explained: "Mr Shand had realised after visiting his doctor that he was suffering from occupational asthma. The study's authors said the frequency of occupational asthma is "systematically underestimated" and that reduction of exposure to asthma-inducing substances and "early and complete identification of workers with symptoms suggestive of asthma would help prevent the disease and effectively manage workers who develop occupational asthma. Prevalence of occupational asthma and immunologic sensitization to psyllium among health personnel in chronic care hospitals. Dr Jones said, 'Interestingly, this does not seem to be the case for other groups at risk of occupational asthma such as bakers and detergent manufacturers. Bakery workers have been known to develop occupational asthma after inhaling particles of flour for many years. Occupational asthma is cited as the result of breathing in poor-quality air at in the workplace. A few epidemiological studies have been published suggesting a link between aerosol drug exposure and occupational asthma in RTs but these are non-conclusive. So far at least 73 people at the plant have been diagnosed as 'definitely or probably' suffering from alveolitis - a disease that affects the tiny air sacs of the lungs - and occupational asthma. by the Occupational Health and Safety Administration and others has linked colophony with occupational asthma.